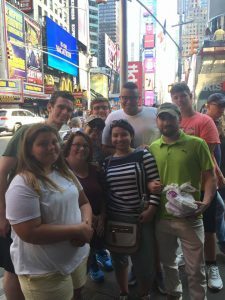 If you’re a youth pastor or youth leader and are considering a youth trip to New York City, then you’ll definitely want to read the experience of Christian Fellowship Assembly’s youth group from Dallas, NC. We discuss everything from scheduling, lodging, and food. Hopefully, this will help ensure that your youth group has the most amazing experience in the big city! Our youth group has enjoyed plenty of outtings before, but none as big as the Big Apple, New York City! All of our trips are fun-filled, but this one had a distinct sense of excitement preceding it. For some of us, it was our very first time visiting New York. Each of us had a specific place in mind that we wanted to see and experience, but there was only so much time to do so. We had one day to explore as much of the city as we could. Quick note: one day simply isn’t enough. Being that we were a group of 10, we could not possibly squeeze everything in to just one day. Instead, we hit the major places of interest to all of us: the Statue of Liberty, China Town, Little Italy, and Time Square! In New York, timing is everything. If you need to be somewhere in the city at a specific time, you have to leave at least 1 1/2 hours to 2 hours before. This is due to the traffic, and it’s majorly important that you understand this, as this is why we listed it at the top. New York traffic ranks third in the world, just behind Los Angeles and Moscow, respectively. We had a ferry ride from Lower Manhatten at 8:00AM. We were staying on Long Island, and left our hotel at 6:30AM, making a quick stop at McDonalds. We arrived with less than 10 minutes before the ferry departed. We were nervously checking the time on our phones, and watching the minutes tick away. Start your day EARLY. Looking back, we should have left at least 30 minutes earlier than what we did. Start your day EARLY. Let’s be honest. Flying is better than driving, at least on your backside! But the one thing that flying can never replace is the experience that only a road trip can offer. If you decide to travel by road to New York, here’s a few things you should consider. The youth group was initially 13 + 1 driver. We were more focused on seating for 14 people, rather than cargo capacity for the luggage of those 14 people. 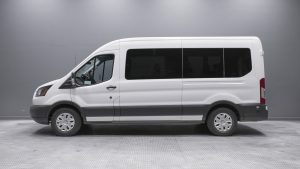 We rented a fifteen passenger Ford Transit van with seating for 15, but once we got the van to the church, we quickly realized that luggage capacity would be an issue. We requested that everyone bring only one bag. Between the back doors and the back row, there was maybe 10 inches of space. Days before the trip, three of the youth informed us that they were unable to go. Based on that, we thought we could remove the backseats. But the rental company had removed the levers, so the seats had to remain with the van. On the morning of our departure from the church in Dallas, NC, we packed the luggage as tightly and as neatly as possible and had just enough space for the 10 us to be seated comfortably. 3 of our boys were over 6 feet tall and another was a stocky lineman at a local high school. Had the other three youths been able to go, it would have been quite the challenge! We left out of Dallas, NC at 6:00AM and arrived at our hotel in Plainview, NY about 7:00PM. It took roughly 10 hours to get to New York City. It took another two hours to actually get through the city onto Long Island and to our hotel in Plainview. By leaving from Dallas, NC early, we were able to get to the hotel early enough for everyone to unwind and recover and still enjoy pizza for the evening! When you’re leaving, give yourself plenty of time the night before to rest and relax. You will need it for the next day! Dallas, NC is located about 30 minutes West of Charlotte, NC, which is in the central part of North Carolina. The typical GPS route and even Google maps suggested we take I-85 to I-95. While this seems shorter, distance wise, it can take even longer to travel I-95 because traffic into and out of Washington DC can become clogged, and this is compounded by the fact once you make it through Washington DC, you still have to get through Baltimore and Philadelphia. We went I-77 to I-81, which allowed us to bypass the major metropolitan areas. It also meant we could see beautiful pastures of Virginia and Pennsylvania on our way up. As we neared our destination, we branched off onto I-78 East, Garden State Parkway North, I-80 East, and then merged onto I-95 where we went across the George Washington Bridge, towards the Bronx. From there we merged onto I-295 which arched down onto Long Island. From I-295 we took I-495 North all the way up to our destination in Plainview, NY. This route took us up and over the thickest parts of traffic, and it also allowed us views of the Manhatten skyline that built up our anticipation for the following day. On the way in we identified the famous buildings, Freedom Tower, the Empire State Building, a Jenga-block building that we later discovered was 56 Lenoard. A note from this: our route was dictated by the location of our hotel. Finding a decent hotel in or near NYC is going to be a little pricey. In New York, don’t go for the cheapest thing you can get. Going too cheap on the hotel may land in you a shady neighborhood. We opted for a hotel on Long Island that gave us a reasonable price in a decent environment. The only con was that it was about two hours outside of Manhatten. If you have the ability to afford a hotel in the middle of Manhatten, do it! With 10 of us, we couldn’t possibly get to all the attractions that each of us wanted to see. But we hit the major locations that were of interest to all of us. We planned everything strategically so that it would take us deeper into the city as the day progressed. We began in Battery Park, in Lower Manhatten where we took a ferry to the Statue of Liberty. The ferry’s run on a route, that first visits the Statue of Liberty and then to Ellis Island. You can decide whether or not you want to disembark on these islands or wait until you return to Battery Park. If you decide to disembark, you can stay on the islands for as long as you like, as the ferry’s stop by every 20 minutes. During the rides, be sure to have your cameras ready as the boats offer stunning views of the skyline! From the statue of Liberty island, we were able to take in a perfect view of the skyline, which allowed us time to get some great group shots. If you want to take a group picture in front of Lady Liberty herself, you will want to have everyone prepared for a selfie on the boat ride in. If you’re on the island at the base of the statue, you will have to angle your camera low to the ground and upwards towards you with the statue looming over you in the background. Both are cool shots though! We returned to Battery Park and from there we cought the Big Bus which are double decker buses that drive around the major landmarks of the city. They had a stop right at Battery Park, so it worked out perfectly for us, as soon as we got off the ferry, we were able to get on the bus. They have three different tickets to choose from, ranging from $50 – $72 per person. A ticket gives you the option of hopping on or hopping off. Meaning that, similar to the ferry’s, you can decide which stops you want to get off at, and which ones you want to skip. Every few minutes another bus stops, and you can get back on and go to the next location up until 6:00PM. After that you would need a Night Time Tour ticket! Now, we can’t guarantee you’ll have the same blessing as we did, but through some negotiating with our southern charm, we were able to get our tickets at a much cheaper rate because we were a group! Like we said, we can’t guarantee this for you, but it’s worth negotiating! We stopped at China Town and signs in Chinese lettering were all around us. We stopped at a small ice cream shop that specialized in ice cream rolls, with a big waffle and our choice of toppings! China Town offered us sights and sounds that made us feel as though we were no longer in the US. There were plenty of gift shops that cought our attention, but what was also interesing was to see the open air store fronts of fresh fruits and vegatables, and one spot featuring raw fish with an odor that kept us moving at a brisk pace. Because China Town borders Little Italy, we crossed the street and were suddenly introduced to aromas of fresh bread and whispers of Frank Sinatra songs. Restuarants competed for our business, with one host finally reeling us in! We enjoyed authentic speghetti and meat balls and chicken alfredo. Our waiter kept us entertained for the entire time. Eating took us about an hour, so make a note of this. As the light of the day began to wane we hopped back on the Big Bus and it took us by The United Nations and Trump Tower and then made a left turn, followed by one more left turn that took us into Time Square. On the approach we could see the renown billboards of LEDs with moving advertisements. The city even took on a new sound from the constant white noise of activity to that of people-chatter and varying degrees of music. There were merchants selling shirts and hats, others were selling food. Time Square has so much to do in such a small area. There’s the Disney Store, M&M World, CBS Store, and so much more, we decided to split into three groups. We would meet back on the main triangle at a set time! It worked out great, because we knew we had a central spot to meet back up in. This is where everyone got to see at least one thing they had on their lists. NOTE: We hit Time Square at the end of the day because the lights are brighter at night! It’s fun in the day time, but it’s not as majestic as night when the lights are at their brightest! I returned to him a blank stare. We thought that the bus was taking us back to Freedom Tower, where we would walk back to Battery Park and to our parking garage that had our van in it. We went through Little Italy and the bus made an unexpected turn. One more turn and we realized that we were on the Manhatten Bridge. We looked at the map and discovered we were on the Night Tour route that went circled through Brooklyn and back towards Lower Manhatten! We don’t exactly remember if the Night Tour was included in our tickets or not, but as we boarded the Big Bus, no one was there to check our tickets. Yay! “I said it!” the youth that had made the prediction said. Again, I returned him a blank stare… Which gave way to laughter from the entire group. The detour was worth it, as the nighttime lights added even more splendor to the city and gave us more opportunities to fill our phones and social media feeds with more pictures! By the time we got back, it was after 11 o’clock. We were all exhausted but it was so worth it, as we laughed the entire way back and as we departed to our rooms. This is a trip we will never forget! If our youth group from Dallas, NC can conquer New York, we know yours can, too!